Vihang A. Naik throws light on the life of a city in all its shades, glory and misery in his City Times and Other Poems. It is an anthology of his intuitive and philosophical poems. The Poems are divided in 6 segments i.e. ‘Love Song of a Journey Man’ is more or less an inner travelogue, The segments, for instance, ‘Mirrored Man’ is about the other chimeras in the city .The people in the city are capricious like the walk of a crab or the colours of a chameleon. While, ‘The Path of Wisdom’ is about the beginning of meditation and knowledge. ‘At the Shore’ records the poet’s sense of futility, memory, pain, exile and alienation at the shore of life. The title of this collection is also the heading for the last of its six sections, in which the city is unfolded as a market place, as a heaven for underdogs, and as a seed bed of change and is observed at evening, at mid-night, by moon light and through fog and haze. Available in both paperback and kindle version. City Times and Other Poems is a set of thought striking poems that sketch different shades of urban life. The anthology is segmented into 6 parts giving different contrasts of city life. It indeed takes a great imagination to express a deeper level of thoughts and ideas in just a bunch of words and you can see in this anthology how the poet succeeded in doing so. The beauty of it lies in the effective choice of words which precisely convey what it intends to upholding the flow of rhythm. Seemingly short poems will give you a greater deal to read in between the lines. The way poet relates simple thoughts of human life to what we see around us and how he dared to explicitly express darker shades of the city, is to be appreciated. The book presents you a whirlpool of emotions; the sense of motivation, introspection, guilt, sorrow… An extraordinary and brilliant work that will go places. The kindle version of the book needs formatting i suppose with regards to its presentation and typesetting. Vihang A. Naik was born in Surat, Gujarat on September 2, 1969. He is India s contemporary poet writing in English. His poems have appeared in literary journals and anthologies along with some significant e-publications. Four collections of his poetry have been published: Poetry Manifesto: New & Selected Poems (2010), Making A Poem (2004), City Times and Other Poems (1993). 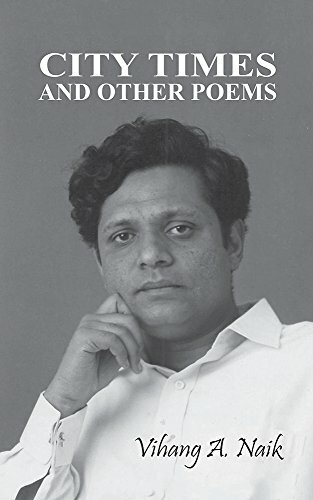 His Gujarati collection of poems include Jeevangeet (Gujarati Poems) in 2001, dedicated to the cause of victims of Gujarat Earthquake of January 26, 2001. He also translates poetry written in the Gujarati language into English, including his own Gujarati language poems.He is educated from The Maharaja Sayajirao University of Baroda with English Literature, Indian Literature in English Translation and Philosophy. He had his primary schooling from Navrachna School in Baroda, Gujarat. He took teaching as a profession serving in colleges since 1996 in Gujarat. He lives and works in Gujarat. India.